The fourth PlayStation is out this fall. PlayStation #4. Pl4St4tion. PlayStation: The Fourth of Its Name. Sony's next console will be out on November 15, and they've told us a whole lot about the PlayStation 4 so far. We've got a full round-up for you right here, with updates as we continue to learn more about the fourth PlayStation. Update (10/17): The next PlayStation is a month away, and we've updated this post with more information about features and games. Update (8/20): Today at the GamesCom conference in Germany, Sony announced a bunch of new games and details surrounding the PS4, including the biggest one: release date. 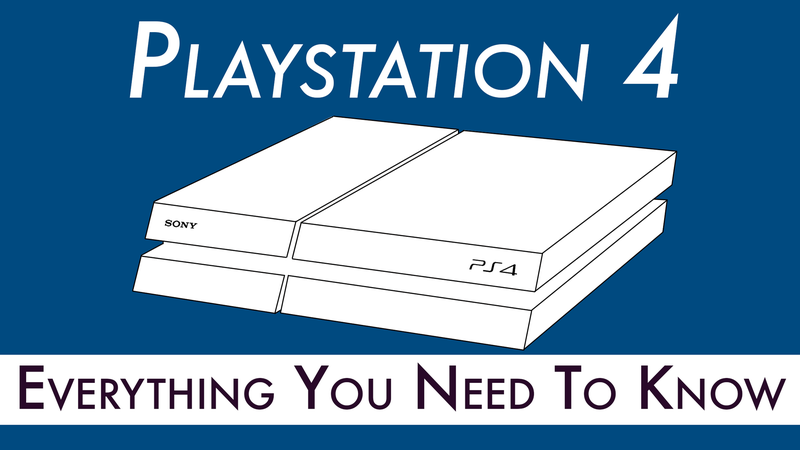 The PS4 will be out on November 15 in North America and November 29 in Europe. We've updated this post with all that and more. That big thing in the middle is a clickable capacitive touchpad. On the top is an LED that can interact with the PlayStation Camera (and change colors based on which player you are in a multiplayer game). Also on the controller are a Share button—to let you record and share video footage of games as you play—and an Options button—essentially the replacement for Start and Select. It also comes in red! And blue! Sony says the controller will work with PCs by default for "basic functions." November 15 for North America; November 29 for Europe. It'll be out in 32 countries then. Like the Xbox One, Sony's next-gen play machine has a bunch of multiplatform games (like Metal Gear Solid V, Final Fantasy XV, and Thief) and a bunch of exclusives. A lot of PC games are also getting console-exclusive PS4 versions, like Final Fantasy XIV, The Witness, and Octodad: Dadliest Catch. Presumably the eternally-delayed Last Guardian will make its way to PS4 as well. At GamesCom, Sony announced a ton of other PS4 games, including a port of Minecraft and a fascinating-looking, Journey-esque game called Rime. We don't have a full list of launch games just yet, and things are changing every day—as of October 17, DriveClub may no longer be a launch game—but we'll add a launch lineup here when we've got one. And, yeah, basically everything will work like it did last time around: used games, offline play, etc. The PlayStation 4 will automatically record video footage as you go through games, and you can hit the Share button on your controller to send that footage to other PSN players. It's currently unclear exactly how many minutes of gameplay the machine will save: reports have claimed 15 minutes, but Sony says they're not revealing the number yet: "At this point, we’re not officially specifying the timeframe of the gameplay recorded beyond saying that it’s the last several minutes," a spokesperson told Kotaku. Also, this feature is totally free. In theory, this is a game-changer: Sony is promising that you'll be able to stream all PS4 games on your Vita (except the ones that wouldn't work on Sony's handheld, like games requiring the camera). PS4 games playable on your portable, whenever you want—if it works, it's a killer feature. You'll also be able to interact with PS4 games using your smartphone/tablet as a supplemental device, like SmartGlass on the Xbox. Third-party developers have claimed that the PS4 is more powerful than the Xbox One, although Microsoft disagrees. PlayStation Plus will work like it does now, Sony says, although you'll have to pay to play games online. You won't need PS Plus to watch Netflix, fortunately. Sony says you'll actually be able to play games while they install to the PS4's hard drive, which could make up for the whole super-slow download speed thing that's been plaguing the PlayStation Network for the past few years. No backwards compatibility, but you might eventually be able to play PS1/PS2/PS3 games through Gaikai's cloud-streaming service, if everything works right. Sony has been vague about their experiments with cloud gaming, but they say they'll use the cloud for PS4 in some way or another at some point in the future. TBA. Current PlayStation Move controllers will be supported on the PS4. A headset is included with the console. Sony has been vague about what kind of third-party headsets will be supported, and they say they'll tell us more about that soon. USB headsets will not be supported at launch. Oh and yes, the PlayStation 4 is crazy for indies. You can have up to 2,000 PSN friends. Good luck getting that many real friends. Video capture devices will work on the PS4, but they won't be available at launch. The mobile app actually sounds kind of neat.